I had previously explained the concept of tablet market tiers and the pattern of upmarket competition among Android vendors as they continue to fight for reasonable hardware margins. Recent tablet install base data from ABI research seems to support this hypothesis and describes the same pattern we saw in the smartphone market. This also helps explains why Apple needs an iPad Pro. 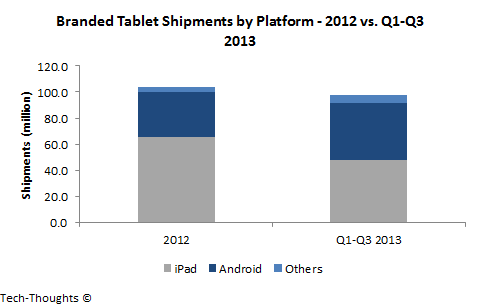 The chart above shows IDC's reported branded tablet shipment estimates from 2012 to Q3 2013, i.e. the time frame between the two install base measurements shown in the first chart. While we're missing one quarter of data (Q4 2013), it is obvious that the growth disparity between the iPad and Android tablets is smaller. Based on this pattern, it seems that iPad sales are being driven by repeat buyers, while Android tablet sales are being driven by first time buyers. Each lower market tier is successively larger and with lower penetration than the previous one. Branded Android tablets entered the large mid-tier market with "good enough" offerings that prevented the iPad from making a downmarket move. As a result, even the lower priced iPad Mini primarily catered to repeat buyers and cannibalized iPad sales instead of increasing the size of Apple's potential market. This explains the rapid drop in the iPad's shipment growth over the last year. 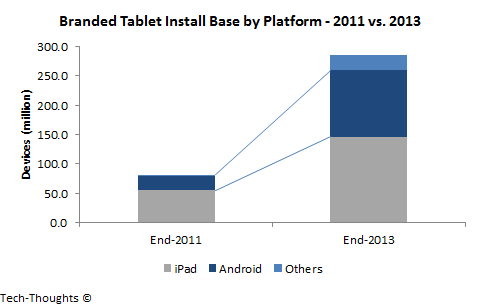 Now, what would happen when branded Android tablet vendors make a concerted upmarket push? This is inevitable because branded vendors are facing increasing margin pressures from regional brands and white box competitors in mid-market tiers. Increasing competition in the limited high-end market could cause iPad shipments to flat-line or even decline over the next few years. 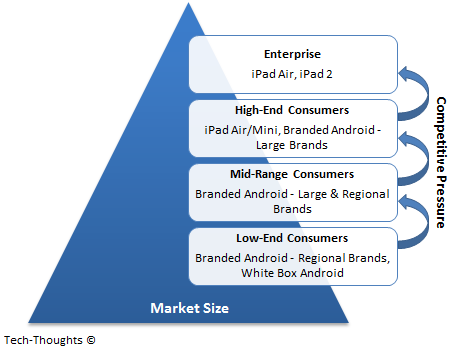 In response, Apple is likely to aggressively target the only market tier remaining above -- the enterprise. There is a reason iPad Pro rumors have been gaining steam.